Honestly I need to amp up my USMNT cover on here. I’ll admit I don’t get to see every game like I would like and I honestly nearly forgot the El Salvador game last week. In fact I didn’t even get to watch all of it but what I did see what the final 20 minutes or so which were fun to view since it was a nice comeback for the US. What we know is this Holland game tomorrow is a biggie. Its in Holland and the Dutch are easily one of the best squads in the World right now. 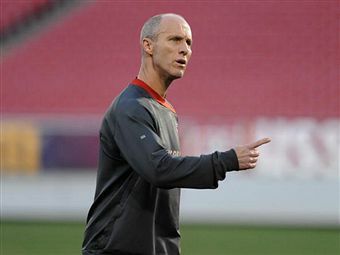 But this is more than a high profile friendly for Bob Bradley it is a chance to really finish filling out his roster for June at the World Cup in South Africa. A good chunk of the roster is probably set but for those bubble players this is a big test. The two friendlies so far this year were definitely for the MLS talent to show their stuff and while they did a decent job only a couple of that B or C bunch will make an sort of dent in this roster come June. Bradley has a couple areas to hammer out before June. The nearly all his defense needs to be figured out, his defensive midfield spot, and a striker. Left Back: It will either be Jonathan Bornstein or Heath Pearce come June in this spot. That I am certain of. Pearce had a nice game against El Salvador and really seems to be doing well in Dallas right now. Having quality playing time has certainly helped him out too. Depending how they look tomorrow will go a long way in determining who gets a roster spot in June. My money is on Pearce right now. Center Back: I still have a guy feeling Oguchi Onyewu will be available come June but some how if he isn’t it will be between Jay DeMerit, Clarence Goodson and Carlos Bocanegra to pick up the slack. I think the bigger story will be if Goodson can continue to impress Bradley. I think should Onyewu return to full health and Goodson continue to impress it will make Bradley’s life tough but in a good way. I’m not saying that he’d take Goodson over Onyewu here but having an improving Goodson only helps our chances in the back. Right back: I worry about the wings in the back but if Pearce can get up to speed on the left I think so can Jonathan Spector on the right. But let’s not sleep on Frank Simek here, this game could be his big chance to make it in June. Defensive Mid: It will likely be a WVHooligan favorite Maurice Edu to go in the midfield along side Michael Bradley. I think at this point this is Edu’s spot to lose. With Ricardo Clark on the outside looking in for a roster spot at this point I think Edu is a good bet, which I am happy with here too. Striker: Ok we know Jozy Altidore is set and if Charlie Davies doesn’t return in time it will come down to three guys: Jeff Cunningham, Robbie Findley or Eddie Johnson. If that is the case my money is on Findley here. I’m curious to see which gets the start tomorrow with Altidore though because both need a strong start to do well. Again tomorrow is a big deal. We must find a way to stop the Dutch on the wings. I’m very worried that Arjen Robben and Rafael van der Vaart will eat our boys alive on the wings. If we find a way to stay in front of them and keep them honest we’ll be fine. If not it could be a very long night in Amsterdam. The Dutch also like to shoot from range, so guys in the midfield and in the center part of the pitch must be on guard. One slip up will put Tim Howard in some jeopardy. Protecting the ball in the midfield will be key for the US. I expect a high tempo to this game from both sides but the US will be wise to slow it down at some points to keep the pressure off the defense. Our forwards will need to work together to get quality looks on goal. The Dutch defense is a savvy one, but isolating one of them at a time can help work wonders. A big game from Landon Donovan also wouldn’t hurt! This won’t be an easy game by any stretch for the US. Holland is damn good and they are very tough to beat in Holland. Forcing mistakes early will boost our confidence if we can get them but giving up silly passes in the midfield and on the wings will doom us. I hate going against the US but until we show up on the road, particularly in Europe I have to go against us. It should be fun to watch…key word is should.